The North Atlantic Treaty Organization (NATO /ˈneɪtoʊ/; French: Organisation du traité de l’Atlantique nord; OTAN), also called the North Atlantic Alliance, is an intergovernmental military alliance between 29 North American and European countries. The organization implements the North Atlantic Treaty that was signed on 4 April 1949. NATO constitutes a system of collective defence whereby its independent member states agree to mutual defence in response to an attack by any external party. NATO’s Headquarters are located in Haren, Brussels, Belgium, while the headquarters of Allied Command Operations is near Mons, Belgium. Since its founding, the admission of new member states has increased the alliance from the original 12 countries to 29. The most recent member state to be added to NATO is Montenegro on 5 June 2017. NATO currently recognizes Bosnia and Herzegovina, Georgia, North Macedonia and Ukraine as aspiring members. An additional 21 countries participate in NATO’s Partnership for Peace program, with 15 other countries involved in institutionalized dialogue programs. The combined military spending of all NATO members constitutes over 70% of the global total. Members have committed to reach or maintain defense spending of at least 2% of GDP by 2024. The North Atlantic Treaty was largely dormant until the Korean War initiated the establishment of NATO to implement it, by means of an integrated military structure: This included the formation of Supreme Headquarters Allied Powers Europe (SHAPE) in 1951, which adopted the Western Union’s military structures and plans. In 1952 the post of Secretary General of NATO was established as the organization’s chief civilian. That year also saw the first major NATO maritime exercises, Exercise Mainbrace and the accession of Greece and Turkey to the organization. Following the London and Paris Conferences, West Germany was permitted to rearm militarily, as they joined NATO in May 1955, which was in turn a major factor in the creation of the Soviet-dominated Warsaw Pact, delineating the two opposing sides of the Cold War. Doubts over the strength of the relationship between the European states and the United States ebbed and flowed, along with doubts over the credibility of the NATO defense against a prospective Soviet invasion – doubts that led to the development of the independent French nuclear deterrent and the withdrawal of France from NATO’s military structure in 1966. In 1982 the newly democratic Spain joined the alliance. The collapse of the Warsaw Pact in 1989–1991 removed the de facto main adversary of NATO and caused a strategic re-evaluation of NATO’s purpose, nature, tasks, and focus on the continent of Europe. This shift started with the 1990 signing in Paris of the Treaty on Conventional Armed Forces in Europe between NATO and the Soviet Union, which mandated specific military reductions across the continent that continued after the dissolution of the Soviet Union in December 1991. At that time, European countries accounted for 34 percent of NATO’s military spending; by 2012, this had fallen to 21 percent. NATO also began a gradual expansion to include newly autonomous Central and Eastern European nations, and extended its activities into political and humanitarian situations that had not formerly been NATO concerns. 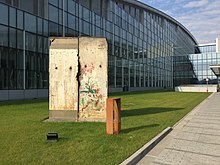 The fall of the Berlin Wall, a section of which is now displayed outside NATO Headquarters, marked a turning point in NATO’s role in Europe. The first post-Cold War expansion of NATO came with German reunification on 3 October 1990, when the former East Germany became part of the Federal Republic of Germany and the alliance. As part of post-Cold War restructuring, NATO’s military structure was cut back and reorganized, with new forces such as the Headquarters Allied Command Europe Rapid Reaction Corps established. The changes brought about by the collapse of the Soviet Union on the military balance in Europe were recognized in the Adapted Conventional Armed Forces in Europe Treaty, which was signed in 1999. The policies of French President Nicolas Sarkozy resulted in a major reform of France’s military position, culminating with the return to full membership on 4 April 2009, which also included France rejoining the NATO Military Command Structure, while maintaining an independent nuclear deterrent. The Russian intervention in Crimea in 2014 led to strong condemnation by NATO nations and the creation of a new “spearhead” force of 5,000 troops at bases in Estonia, Lithuania, Latvia, Poland, Romania, and Bulgaria. At the subsequent 2014 Wales summit, the leaders of NATO’s member states formally committed for the first time to spend the equivalent of at least 2% of their gross domestic products on defence by 2024, which had previously been only an informal guideline. In an effort to stop Slobodan Milošević‘s Serbian-led crackdown on KLA separatists and Albanian civilians in Kosovo, the United Nations Security Council passed Resolution 1199 on 23 September 1998 to demand a ceasefire. Negotiations under US Special Envoy Richard Holbrooke broke down on 23 March 1999, and he handed the matter to NATO, which started a 78-day bombing campaign on 24 March 1999. Operation Allied Force targeted the military capabilities of what was then the Federal Republic of Yugoslavia. During the crisis, NATO also deployed one of its international reaction forces, the ACE Mobile Force (Land), to Albania as the Albania Force (AFOR), to deliver humanitarian aid to refugees from Kosovo. Though the campaign was criticized for high civilian casualties, including bombing of the Chinese embassy in Belgrade, Milošević finally accepted the terms of an international peace plan on 3 June 1999, ending the Kosovo War. On 11 June, Milošević further accepted UN resolution 1244, under the mandate of which NATO then helped establish the KFOR peacekeeping force. Nearly one million refugees had fled Kosovo, and part of KFOR’s mandate was to protect the humanitarian missions, in addition to deterring violence. In August–September 2001, the alliance also mounted Operation Essential Harvest, a mission disarming ethnic Albanian militias in the Republic of Macedonia. As of 1 December 2013, 4,882 KFOR soldiers, representing 31 countries, continue to operate in the area. 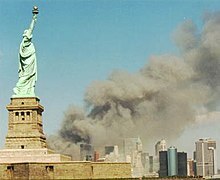 The September 11 attacks in the United States caused NATO to invoke Article 5 of the NATO Charter for the first time in the organization’s history. The Article says that an attack on any member shall be considered to be an attack on all. The invocation was confirmed on 4 October 2001 when NATO determined that the attacks were indeed eligible under the terms of the North Atlantic Treaty. The eight official actions taken by NATO in response to the attacks included Operation Eagle Assist and Operation Active Endeavour, a naval operation in the Mediterranean Sea which is designed to prevent the movement of terrorists or weapons of mass destruction, as well as enhancing the security of shipping in general which began on 4 October 2001. The alliance showed unity: On 16 April 2003, NATO agreed to take command of the International Security Assistance Force (ISAF), which includes troops from 42 countries. The decision came at the request of Germany and the Netherlands, the two nations leading ISAF at the time of the agreement, and all nineteen NATO ambassadors approved it unanimously. The handover of control to NATO took place on 11 August, and marked the first time in NATO’s history that it took charge of a mission outside the north Atlantic area. In August 2004, during the Iraq War, NATO formed the NATO Training Mission – Iraq, a training mission to assist the Iraqi security forces in conjunction with the US led MNF-I. The NATO Training Mission-Iraq (NTM-I) was established at the request of the Iraqi Interim Government under the provisions of United Nations Security Council Resolution 1546. The aim of NTM-I was to assist in the development of Iraqi security forces training structures and institutions so that Iraq can build an effective and sustainable capability that addresses the needs of the nation. NTM-I was not a combat mission but is a distinct mission, under the political control of NATO’s North Atlantic Council. Its operational emphasis was on training and mentoring. The activities of the mission were coordinated with Iraqi authorities and the US-led Deputy Commanding General Advising and Training, who was also dual-hatted as the Commander of NTM-I. The mission officially concluded on 17 December 2011. On 20 March 2011, NATO states agreed on enforcing an arms embargo against Libya with Operation Unified Protector using ships from NATO Standing Maritime Group 1 and Standing Mine Countermeasures Group 1, and additional ships and submarines from NATO members. They would “monitor, report and, if needed, interdict vessels suspected of carrying illegal arms or mercenaries“. On 24 March, NATO agreed to take control of the no-fly zone from the initial coalition, while command of targeting ground units remained with the coalition’s forces. NATO began officially enforcing the UN resolution on 27 March 2011 with assistance from Qatar and the United Arab Emirates. By June, reports of divisions within the alliance surfaced as only eight of the 28 member nations were participating in combat operations, resulting in a confrontation between US Defense Secretary Robert Gates and countries such as Poland, Spain, the Netherlands, Turkey, and Germany to contribute more, the latter believing the organization has overstepped its mandate in the conflict. In his final policy speech in Brussels on 10 June, Gates further criticized allied countries in suggesting their actions could cause the demise of NATO. The German foreign ministry pointed to “a considerable [German] contribution to NATO and NATO-led operations” and to the fact that this engagement was highly valued by President Obama. While the mission was extended into September, Norway that day announced it would begin scaling down contributions and complete withdrawal by 1 August. Earlier that week it was reported Danish air fighters were running out of bombs. The following week, the head of the Royal Navy said the country’s operations in the conflict were not sustainable. By the end of the mission in October 2011, after the death of Colonel Gaddafi, NATO planes had flown about 9,500 strike sorties against pro-Gaddafi targets. A report from the organization Human Rights Watch in May 2012 identified at least 72 civilians killed in the campaign. Following a coup d’état attempt in October 2013, Libyan Prime Minister Ali Zeidan requested technical advice and trainers from NATO to assist with ongoing security issues. NATO has twenty-nine members, mainly in Europe and North America. Some of these countries also have territory on multiple continents, which can be covered only as far south as the Tropic of Cancer in the Atlantic Ocean, which defines NATO’s “area of responsibility” under Article 6 of the North Atlantic Treaty. During the original treaty negotiations, the United States insisted that colonies such as the Belgian Congo be excluded from the treaty. French Algeria was however covered until their independence on 3 July 1962. Twelve of these twenty-nine are original members who joined in 1949, while the other seventeen joined in one of seven enlargement rounds. From the mid-1960s to the mid-1990s, France pursued a military strategy of independence from NATO under a policy dubbed “Gaullo-Mitterrandism”. Nicolas Sarkozy negotiated the return of France to the integrated military command and the Defence Planning Committee in 2009, the latter being disbanded the following year. France remains the only NATO member outside the Nuclear Planning Group and unlike the United States and the United Kingdom, will not commit its nuclear-armed submarines to the alliance. Few members spend more than two percent of their gross domestic product on defence, with the United States accounting for three quarters of NATO defense spending. New membership in the alliance has been largely from Central and Eastern Europe, including former members of the Warsaw Pact. Accession to the alliance is governed with individual Membership Action Plans, and requires approval by each current member. NATO currently has two candidate countries that are in the process of joining the alliance: Bosnia and Herzegovina and North Macedonia. North Macedonia signed an accession protocol to become a NATO member state in February 2019, which is undergoing ratification by the member states. Its accession had been blocked by Greece for many years due to the Macedonia naming dispute, which was resolved in 2018 by the Prespa agreement. In order to support each other in the process, new and potential members in the region formed the Adriatic Charter in 2003. Georgia was also named as an aspiring member, and was promised “future membership” during the 2008 summit in Bucharest, though in 2014, US President Barack Obama said the country was not “currently on a path” to membership. Russia continues to oppose further expansion, seeing it as inconsistent with informal understandings between Soviet leader Mikhail Gorbachev and European and US negotiators that allowed for a peaceful German reunification. NATO’s expansion efforts are often seen by Moscow leaders as a continuation of a Cold War attempt to surround and isolate Russia, though they have also been criticised in the West. A June 2016 Levada poll found that 68% of Russians think that deploying NATO troops in the Baltic states and Poland—former Eastern bloc countries bordering Russia—is a threat to Russia. In contrast 65% of Poles surveyed in 2017 Pew Research Center report identified Russia as a “major threat”, with an average of 31% saying so across all NATO countries, and 67% of Poles surveyed in 2018 favour US forces being based in Poland. Of non-CIS Eastern European countries surveyed by Gallup in 2016, all but Serbia and Montenegro were more likely than not to view NATO as a protective alliance rather than a threat. Ukraine‘s relationship with NATO and Europe has been politically controversial, and improvement of these relations was one of the goals of the “Euromaidan” protests that saw the ousting of pro-Russian President Viktor Yanukovych in 2014. In March 2014, Prime Minister Arseniy Yatsenyuk reiterated the government’s stance that Ukraine is not seeking NATO membership. Ukraine’s president subsequently signed a bill dropping his nation’s nonaligned status in order to pursue NATO membership, but signaled that it would hold a referendum before seeking to join. Ukraine is one of eight countries in Eastern Europe with an Individual Partnership Action Plan. IPAPs began in 2002, and are open to countries that have the political will and ability to deepen their relationship with NATO. The European Union (EU) signed a comprehensive package of arrangements with NATO under the Berlin Plus agreement on 16 December 2002. With this agreement, the EU was given the possibility to use NATO assets in case it wanted to act independently in an international crisis, on the condition that NATO itself did not want to act – the so-called “right of first refusal“. For example, Article 42(7) of the 1982 Treaty of Lisbon specifies that “If a Member State is the victim of armed aggression on its territory, the other Member States shall have towards it an obligation of aid and assistance by all the means in their power”. The treaty applies globally to specified territories whereas NATO is restricted under its Article 6 to operations north of the Tropic of Cancer. It provides a “double framework” for the EU countries that are also linked with the PfP programme. Political dialogue with Japan began in 1990, and since then, the Alliance has gradually increased its contact with countries that do not form part of any of these cooperation initiatives. In 1998, NATO established a set of general guidelines that do not allow for a formal institutionalisation of relations, but reflect the Allies’ desire to increase cooperation. Following extensive debate, the term “Contact Countries” was agreed by the Allies in 2000. By 2012, the Alliance had broadened this group, which meets to discuss issues such as counter-piracy and technology exchange, under the names “partners across the globe” or “global partners”. Australia and New Zealand, both contact countries, are also members of the AUSCANNZUKUS strategic alliance, and similar regional or bilateral agreements between contact countries and NATO members also aid cooperation. Colombia is the NATO’s latest partner and Colombia has access to the full range of cooperative activities NATO offers to partners; Colombia became the first and only Latin American country to cooperate with NATO. The North Atlantic Council (NAC) is the body which has effective governance authority and powers of decision in NATO, consisting of member states’ permanent representatives or representatives at higher level (ministers of foreign affairs or defence, or heads of state or government). The NAC convenes at least once a week and takes major decisions regarding NATO’s policies. 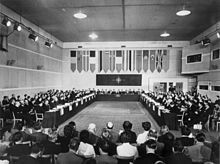 The meetings of the North Atlantic Council are chaired by the Secretary General and, when decisions have to be made, action is agreed upon on the basis of unanimity and common accord. There is no voting or decision by majority. Each nation represented at the Council table or on any of its subordinate committees retains complete sovereignty and responsibility for its own decisions. NATO Headquarters, located on Boulevard Léopold III/Leopold III-laan, B-1110 Brussels, which is in Haren, part of the City of Brussels municipality. The staff at the Headquarters is composed of national delegations of member countries and includes civilian and military liaison offices and officers or diplomatic missions and diplomats of partner countries, as well as the International Staff and International Military Staff filled from serving members of the armed forces of member states. Non-governmental citizens’ groups have also grown up in support of NATO, broadly under the banner of the Atlantic Council/Atlantic Treaty Association movement. Locations of NATO‘s two strategic commands—Allied Command Transformation (ACT; yellow marks) and Allied Command Operations (ACO; red marks)—the latter of which has Supreme Headquarters Allied Powers Europe (SHAPE) as its headquarters. The subordinate centres of ACT and subordinate commands and joint force commands of ACO are also shown, minus the new Joint Force Command – Norfolk. ^ “Defence Expenditure of NATO Countries (2010–2018)” (PDF). Nato.int. Retrieved 10 July 2018. ^ “What is NATO?”. NATO Headquarters, Brussels, Belgium. 26 May 2017. Retrieved 26 May 2017. ^ Cook, Lorne (25 May 2017). “NATO: The World’s Largest Military Alliance Explained”. MilitaryTimes.com. The Associated Press, US. Retrieved 26 May 2017. ^ NATO. “Enlargement”. NATO. Retrieved 18 March 2018. ^ “The SIPRI Military Expenditure Database”. Milexdata.sipri.org. Archived from the original on 28 March 2010. Retrieved 22 August 2010. ^ Erlanger, Steven (26 March 2014). “Europe Begins to Rethink Cuts to Military Spending”. nytimes.com. Retrieved 3 April 2014. Last year, only a handful of NATO countries met the target, according to NATO figures, including the United States, at 4.1 percent, and Britain, at 2.4 percent. ^ “The origins of WEU: Western Union”. University of Luxembourg. December 2009. Retrieved 23 July 2018. ^ “A short history of NATO”. NATO. Retrieved 26 March 2017. ^ Ismay, Hastings (4 September 2001). “NATO the first five years 1949–1954”. NATO. Archived from the original on 15 March 2017. Retrieved 10 April 2012. ^ Baldwin, Hanson (28 September 1952). “Navies Meet the Test in Operation Mainbrace“. New York Times: E7. Retrieved 10 April 2012. ^ “NATO: The Man with the Oilcan”. Time. 24 March 1952. Retrieved 17 January 2012. ^ a b c Cody, Edward (12 March 2009). “After 43 Years, France to Rejoin NATO as Full Member”. The Washington Post. Retrieved 19 December 2011. ^ Harding, Luke (14 July 2007). “Kremlin tears up arms pact with Nato”. The Observer. Retrieved 1 May 2012. ^ “The future of NATO: Bad timing”. The Economist. 31 March 2012. Retrieved 3 April 2012. ^ a b “NATO Announces Special 70th Anniversary Summit In London In December”. Radio Free Europe/Radio Liberty. 6 February 2019. Retrieved 6 April 2019. ^ Jing Ke (2008). “Did the US Media Reflect the Reality of the Kosovo War in an Objective Manner? A Case Study of The Washington Post and The Washington Times” (PDF). University of Rhode Island. In 1999, NATO unprecedently involved itself in the Kosovo War by bombing the FRY (Federal Republic of Yugoslavia) without the UN approval. ^ “Invocation of Article 5 confirmed”. North Atlantic Treaty Organization. 3 October 2001. Retrieved 29 January 2013. ^ “Counter-piracy operations”. North Atlantic Treaty Organization. Retrieved 27 May 2011. ^ “The consultation process and Article 4”. NATO. 17 March 2016. Retrieved 6 April 2019. ^ a b Stratton, Allegra (17 June 2008). “Sarkozy military plan unveiled”. The Guardian. UK. ^ “Defence Planning Committee (DPC) (Archived)”. NATO. 11 November 2014. Retrieved 13 August 2016. ^ “Statement by the North Atlantic Council following meeting under article 4 of the Washington Treaty”. NATO Newsroom. 4 March 2014. Retrieved 2 April 2014. ^ Techau, Jan (2 September 2015). “The Politics of 2 Percent: NATO and the Security Vacuum in Europe”. Carnegie Europe. Retrieved 11 July 2018. A month before [the alliance’s summit in Riga in 2006], Victoria Nuland, then the U.S. ambassador to NATO, called the 2 percent metric the “unofficial floor” on defense spending in NATO. But never had all governments of NATO’s 28 nations officially embraced it at the highest possible political level – a summit declaration. ^ “NATO’s Operations 1949–Present” (PDF). NATO. 2009. Retrieved 3 March 2013. ^ Tice, Jim (22 February 2009). “Thousands more now eligible for NATO Medal”. Army Times. Retrieved 11 April 2012. ^ “Nato to strike Yugoslavia”. BBC News. 24 March 1999. Retrieved 25 September 2015. ^ Thorpe, Nick (24 March 2004). “UN Kosovo mission walks a tightrope”. BBC News. Retrieved 11 April 2012. ^ a b “Operation Shining Hope“. Global Security. 5 July 2011. Retrieved 11 April 2012. ^ “Kosovo Report Card”. International Crisis Group. 28 August 2000. Archived from the original on 4 March 2012. Retrieved 11 April 2012. ^ Helm, Toby (27 September 2001). “Macedonia mission a success, says Nato”. The Daily Telegraph. Retrieved 11 April 2012. ^ “Kosovo Force (KFOR) Key Facts and Figures” (PDF). NATO. 1 December 2013. Retrieved 4 September 2014. ^ “NATO reaffirms power to take action without UN approval”. CNN. 24 April 1999. Retrieved 4 September 2013. ^ “Allied Command Atlantic”. NATO Handbook. NATO. Archived from the original on 13 August 2008. Retrieved 3 September 2008. ^ “NATO Update: Invocation of Article 5 confirmed”. Nato.int. 2 October 2001. Retrieved 22 August 2010. ^ “NATO’s Operations 1949–Present” (PDF). NATO. 22 January 2010. Retrieved 4 September 2013. ^ “UNSC Resolution 1510, October 13, 2003” (PDF). Retrieved 5 July 2010. ^ “ISAF Chronology”. Nato.int. Retrieved 5 July 2010. ^ Morales, Alex (5 October 2006). “NATO Takes Control of East Afghanistan From U.S.-Led Coalition”. Bloomberg L.P. Retrieved 4 September 2013. ^ “La France et l’OTAN”. Le Monde (in French). France. Retrieved 16 July 2011. ^ “NATO sets “irreversible” but risky course to end Afghan war”. Reuters. Reuters. 21 May 2012. Retrieved 22 May 2012. ^ El Gamal, Rania (17 December 2011). “NATO closes up training mission in Iraq”. Reuters. Retrieved 17 January 2012. ^ Croft, Adrian (3 October 2012). “NATO demands halt to Syria aggression against Turkey”. Reuters. Retrieved 3 October 2012. ^ Ford, Dana (26 July 2015). “Turkey calls for rare NATO talks after attacks along Syrian border”. Cnn.com. CNN. Retrieved 26 July 2015. ^ “Operation Ocean Shield“. NATO. Archived from the original on 13 May 2011. Retrieved 3 March 2011. ^ “2009 Operation Ocean Shield News Articles”. NATO. October 2010. Archived from the original on 29 April 2011. Retrieved 19 May 2011. ^ “Operation Ocean Shield purpose”. 12 July 2016. Retrieved 27 September 2016. ^ a b “Statement by the NATO Secretary General on Libya arms embargo”. NATO. 22 March 2011. ^ “Press briefing by NATO Spokesperson Oana Lungescu, Brigadier General Pierre St-Amand, Canadian Air Force and General Massimo Panizzi, spokesperson of the Chairman of the Military Committee”. NATO. 23 March 2011. ^ “NATO reaches deal to take over Libya operation; allied planes hit ground forces”. Washington Post. 25 March 2011. Archived from the original on 17 February 2013. ^ “NATO to police Libya no-fly zone”. English.aljazeera.net. 24 March 2011. ^ O’Sullivan, Arieh (31 March 2011). “UAE and Qatar pack an Arab punch in Libya operation”. Jerusalem Post. se. Retrieved 29 January 2013. ^ Birnbaum, Michael (10 June 2011). “Gates rebukes European allies in farewell speech”, Washington Post. Retrieved 10 June 2011. ^ “NATO: Ongoing resistance by pro-Gadhafi forces in Libya is ‘surprising‘“. The Washington Post. UPI. 11 October 2011. Retrieved 29 January 2013. ^ “NATO strategy in Libya may not work elsewhere”. USA Today. 21 October 2011. Retrieved 22 October 2011. ^ Tharoor, Ishaan (16 May 2012). “How Many Innocent Civilians Did NATO Kill in Libya?”. Time Magazine. Retrieved 9 April 2016. ^ Croft, Adrian. “NATO to advise Libya on strengthening security forces”. Reuters. ^ “The area of responsibility”. NATO Declassified. NATO. 23 February 2013. Retrieved 28 September 2013. ^ “Washington Treaty”. NATO. 11 April 2011. Retrieved 28 September 2013. ^ Adrian Croft (19 September 2013). “Some EU states may no longer afford air forces-general”. Reuters. Retrieved 31 March 2013. ^ Craig Whitlock (29 January 2012). “NATO allies grapple with shrinking defense budgets”. Washington Post. Archived from the original on 30 May 2013. Retrieved 29 March 2013. ^ “Macedonia signs Nato accession agreement”. BBC. 6 February 2019. Retrieved 6 February 2019. ^ Joy, Oliver (16 January 2014). “Macedonian PM: Greece is avoiding talks over name dispute”. CNN. Retrieved 18 April 2014. ^ Ramadanovic, Jusuf; Nedjeljko Rudovic (12 September 2008). “Montenegro, BiH join Adriatic Charter”. 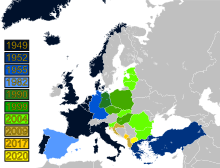 Southeast European Times. Retrieved 24 March 2009. ^ George J, Teigen JM (2008). “NATO Enlargement and Institution Building: Military Personnel Policy Challenges in the Post-Soviet Context”. European Security. 17 (2): 346. doi:10.1080/09662830802642512. ^ Cathcourt, Will (27 March 2014). “Obama Tells Georgia to Forget About NATO After Encouraging It to Join”. The Daily Beast. Retrieved 15 April 2014. ^ Klussmann, Uwe; Schepp, Matthias; Wiegrefe, Klaus (26 November 2009). “NATO’s Eastward Expansion: Did the West Break Its Promise to Moscow?”. Spiegel Online. Retrieved 7 April 2014. ^ “Medvedev warns on Nato expansion”. BBC News. 25 March 2008. Retrieved 20 May 2010. ^ “Pew survey: Russia disliked around world; most in Poland, Turkey see Kremlin as major threat”. Kyiv Post. 16 August 2017. Retrieved 4 September 2018. ^ “NATO summit: Poland pins its hopes on the USA”. Deutsche Welle. Retrieved 4 September 2018. ^ Smith, Michael. “Most NATO Members in Eastern Europe See It as Protection”. Gallup. Retrieved 4 September 2018. ^ Polityuk, Pavel (18 March 2014). “PM tells Ukrainians: No NATO membership, armed groups to disarm”. Reuters. Retrieved 27 March 2014. ^ “Ukrainian President Signs Law Allowing NATO Membership Bid”. Radio Free Europe/Radio Liberty. 29 December 2014. Retrieved 7 August 2015. ^ “NATO Topics: Individual Partnership Action Plans”. Nato.int. Retrieved 29 January 2013. ^ Epstein, Rachel (2006). “Nato Enlargement and the Spread of Democracy: Evidence and Expectations”. Security Studies. 14: 63. doi:10.1080/09636410591002509. ^ “Cooperative Archer military exercise begins in Georgia”. RIA Novosti. 9 July 2007. Retrieved 3 December 2013. ^ a b “Partnership for Peace”. Nato.int. Retrieved 3 March 2011. ^ “Nato and Belarus – partnership, past tensions and future possibilities”. Foreign Policy and Security Research Center. Archived from the original on 20 October 2013. Retrieved 25 November 2010. ^ “NATO Topics: The Euro-Atlantic Partnership Council”. Nato.int. Retrieved 22 August 2010. ^ “Declaration by the North Atlantic Treaty Organization and the Islamic Republic of Afghanistan”. Nato.int. Archived from the original on 8 September 2010. Retrieved 22 August 2010. ^ “NATO Partner countries”. Nato.int. 6 March 2009. Retrieved 15 June 2011. ^ “NATO PARTNERSHIPS: DOD Needs to Assess U.S. Assistance in Response to Changes to the Partnership for Peace Program” (PDF). United States Government Accountability Office. September 2010. Retrieved 27 August 2013. ^ “Partners”. NATO. 2 April 2012. Retrieved 12 October 2012. ^ “Relations with Colombia”. nato.int. 19 May 2017. Retrieved 20 May 2017. ^ “NATO homepage”. Retrieved 12 March 2006. ^ “NATO Headquarters”. Nato.int. 10 August 2010. Retrieved 22 August 2010. ^ “France to rejoin NATO command”. CNN. 17 June 2008. Retrieved 4 September 2013. ^ Fuller, Thomas (18 February 2003). “Reaching accord, EU warns Saddam of his ‘last chance‘“. International Herald Tribune. Archived from the original on 12 October 2007. Retrieved 15 July 2007. ^ “The Rapid Deployable Corps”. NATO. 26 November 2012. Retrieved 4 September 2013. Art, Robert J. (1998). “Creating a Disaster: NATO’s Open Door Policy”. Political Science Quarterly. 113 (3): 383–403. doi:10.2307/2658073. JSTOR 2658073. Bethlehem, Daniel L.; Weller, Marc (1997). The ‘Yugoslav’ Crisis in International Law. Cambridge International Documents Series. 5. Cambridge University Press. ISBN 978-0-521-46304-1. Isby, David C.; Kamps Jr., Charles (1985). Armies of NATO’s Central Front. Jane’s Information Group. ISBN 978-0-7106-0341-8. Dr. Thomas-Durell Young, “Reforming NATO’s Military Structures: The Long-Term Study and Its Implications for Land Forces”, Strategic Studies Institute, 1 May 1998. Often taken for granted, the Alliance’s integrated command structure provides the basis for NATO’s collective defense, and increasingly, as seen in Bosnia, its ability to undertake peace support operations. However, the very value by which nations hold the structure has resulted in a difficult and time-consuming reorganization process, which has produced only limited reforms. Dr. Thomas-Durell Young, “Multinational Land Formations and NATO: Reforming Practices and Structures”, Strategic Studies Institute, 1 December 1997. Reduced national force structures, new NATO roles and missions emanating from the military implementation of Alliance Strategy and the rapid reaction requirements associated with the embryonic Combined Joint Task Forces (CJTF) concept are but three of a multitude of inter-related issues. Hastings Ismay, 1st Baron Ismay (1954). “NATO: The First Five Years”. Paris: NATO. Retrieved 4 April 2017. Pedlow, Dr Gregory W. “Evolution of NATO’s Command Structure 1951-2009” (PDF). aco.nato.int. Brussels(? ): NATO ACO. Retrieved 18 February 2015. Atlantic Council of the United States (August 2003). “Transforming the NATO Military Command Structure: A New Framework for Managing the Alliance’s Future” (PDF). Archived from the original (PDF) on 3 October 2012. “NATO collected news and commentary”. The Guardian. “NATO collected news and commentary”. The New York Times.